Weekend mornings are so perfect for warm waffles with toppings or sides. Not many people take the time to make waffles from scratch anymore. There are so many frozen varieties available, even ones that are gluten-free, vegan, or Paleo. Though, they really aren’t that tasty. Of course, you could also buy a packaged dry waffle mix, just add liquid, and pour it in your hot waffle iron. But, we aren’t doing that here. Let’s get back to basics with a good old fashioned waffle recipe and make steaming hot, fresh waffles using the George Foreman Grill with the removable waffle iron plates inserted. The plates are non-stick, dishwasher safe, and have cool-touch handles. Making waffles can be messy, but clean up is relatively easy with the Foreman Grill plates. The recipe that follows is adapted from an Alton Brown favorite. This recipe is fairly traditional, except that it does have a little extra fiber from the addition of the whole wheat flour. These will be a little darker in color than waffles made with just all-purpose flour. Don’t try to cut calories by changing out the buttermilk for whole milk. Believe it or not, buttermilk has less fat. The unique flavor is what we are going for here. You will need 2 medium to large bowls. In one bowl whisk together all of the dry ingredients. In the other bowl beat the eggs, then whisk in the butter. Lastly, whisk in the buttermilk. Add the wet ingredients to the bowl of flour mixture, stirring with a rubber spatula. Don’t over mix or it will become too dense. Set this aside to rest for 5 minutes. Meanwhile, coat the waffle plates with vegetable oil spray, unless you anticipate that the batter won’t stick, and insert them into the grill. Turn the heat on to the highest setting or 400°F, depending on your machine model. Close the top and allow the grill to preheat. The red indicator light will come on when the grill is ready. Pour or ladle the waffle batter onto the bottom plate until it is covered but not overflowing, approximately 2/3 cup. As soon as the batter starts to form air bubbles at the outer edges (approximately 1 minute), close the top of the grill and cook for another 5 minutes. Open the top to see if the waffles are the color you like. If not, close the lid for another minute or two. After opening the lid, unplug or turn off the grill. Allow the waffles to slightly cool for a minute. Then remove them with tongues or a fork And serve warm with your favorite toppings, such as maple syrup, chocolate chips, or banana slices and toasted nuts. Are you looking for more fiber, less fat, and fewer calories in your waffles? There are healthy waffle recipes to choose from that can still be made in the Foreman Grill. You can switch out the butter and eggs for fruit puree, use whole grain flour or nut meal as the flour base, and replace the sugar with pure maple syrup or stevia. The texture is going to be different, but the flavor will still be there. The following recipe is adapted from the Chocolate Covered Katie food website. It is low in calories, completely vegan, sugar free, and can be made gluten free. You will need 2 bowls. In one bowl place the dry ingredients and whisk. Stir the wet ingredients in the other bowl. Pour wet into dry and stir well. While the mixture rests for a few minutes, coat the plates with the oil spray and preheat the grill just as described in the first recipe. When the grill is ready, pour 2/3 cup of the batter into the preheated bottom waffle plate and cook for approximately 5 minutes. Serve these warm with healthy toppings of fresh berries, coconut milk yogurt, or very dark vegan chocolate chunks (or all of these). Remember homemade waffles on cold winter mornings? There is something about the sweet smell of real waffles when they are cooking. 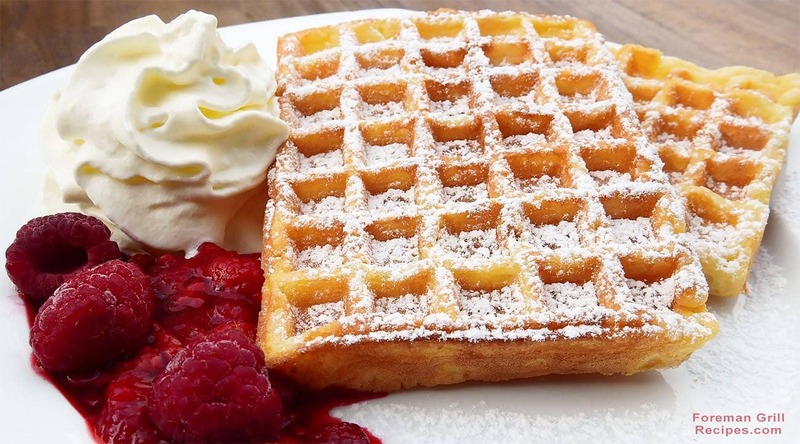 It must be the way a waffle iron emits vapors or steam as the batter cooks at a very high heat. That never happens with a toaster waffle. The thing that is so great about waffles is that they can be either sweet or savory. An herb and cheddar cheese waffle recipe comes to mind when thinking of a savory version. Southern fried chicken and waffles is probably the best combination of both sweet and savory. However you like your waffles, try making a homemade batch the next time you a little time to spare. Homemade waffles are one of the most classic comfort foods. Have them for breakfast with sweet fruit, dinner with meat and gravy piled on top, or for dessert with ice cream. Make waffles the classic way, or make a healthier version. There are no rules other than to enjoy them. At what temperature do I set the griddle on?